“If the Venezuelan government, for example, approves a law to protect consumers, they say, ‘Take notice, Chavez is a tyrant! '” Chavez said in one of his recent weekly television shows. Do not hear me saying that I support Chavez and his ilk–I most certainly do not. He is a tyrant despite this rhetoric. The fact that he can even draw these comparisons is what bothers me. Once again, we have lost our moral high ground. President Bush, the buck stops with you. 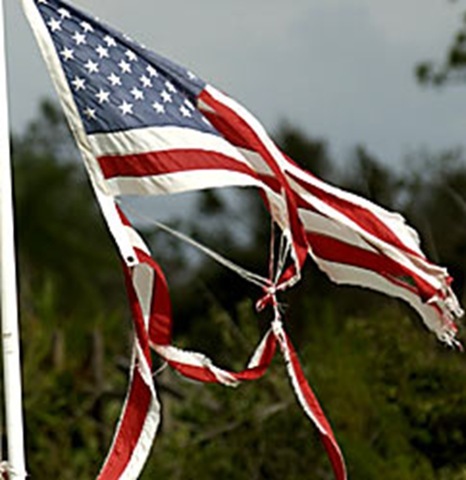 You have damaged our great country. You led us into Iraq. You led congress into passing the bailout package. Thanks a whole helluva lot. This entry was posted on Friday, October 10th, 2008 at 9:47 am and is filed under Politics. You can follow any responses to this entry through the RSS 2.0 feed. You can leave a response, or trackback from your own site. While I am saddened to see that we are not regarded as highly as we once were, I am neither surprised nor motivated to change due to these external opinions. First, I am not surprised as I have come to realize that no one is ever viewed as favorably by others as they are by themselves. This includes myself as well as my country. Second, I am not motivated to change based solely upon the criticisms levied by the world. As a man and as an American, I want to be judged by the one who allowed this nation to be created. He also allowed this nation to become a positive influence to many generations. And He placed me into this time and place to have an impact on this time and place. My God and King is my judge. I appreciate when others want to lift that burden from Him and judge me themselves. But I’ll take His judgments any day. What we need to do is ask the one who matters most whether we are making the difference that He desires from us. While I cannot speak for America, I can speak for myself. I know that I am not doing everything He has called me to do – within my home or within my community. I must humbly (and repeatedly) ask for forgiveness and ask for the strength to act as a man of God. If I can be faithful to this calling, then I can extend my reach to the people around me. If we can be faithful, the we can extend our reach to the community around us – and so on. In my humble opinion, we (conservative Christians) reached well beyond our grasp when we began to trust any government to forward our cause. Remember, our cause is Christ’s mission, not the mission of any political party or ideology. And when we thought we could change the politics in Washington, we forgot Christ’s command to render unto Caesar that which is Caesar’s. This doesn’t just mean taxes. It means that we should only trust the government for worldly affairs – not matters of eternal consequence. We should never place politics above the compelling nature of our faith. Our mission is the Great Commission. BTW, in economic terms, credibility is measured in supply and demand. In terms of currency, that usually means exchange rates. If people trust the U.S. dollar in times of crisis, they will invest in U.S. dollars and treasury notes. If not, they’ll invest in other things. Over the past two years, we saw a flight to oil. And when OPEC no longer charged for oil in terms of the U.S. dollar, our currency sustained a major correction. Now that the financial world is in crisis, it is somewhat surprising to see the U.S. dollar rising so sharply – while sterling and the Euro are flagging. Awesome reply, bro. Awesome. I especially like the last paragraph. That sums it up right there. I am duly chastised for the rant. Both yesterday at church where I was really convicted of not praying for this country and by your reply. 100% truth in both instances. I will say that I am not suggesting we should be motivated by these external opinions. But when I find myself thinking that Chavez has a point, then I *know* something is amiss.